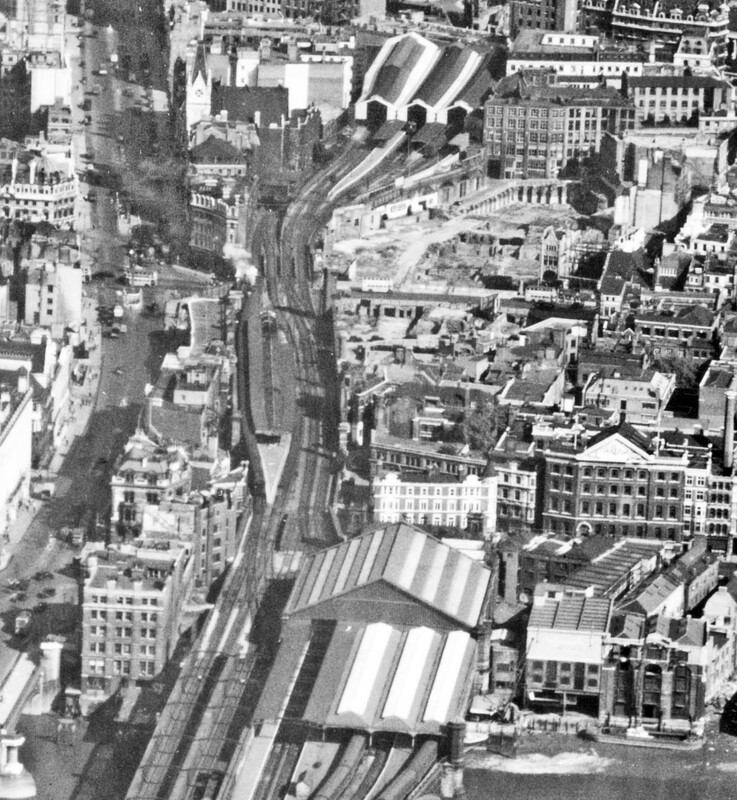 An aerial view facing north from August 1948, showing Blackfriars station straddling the Thames at the bottom, the closed Ludgate Hill station in the centre and Holborn Viaduct station at the top. The proximity of the three stations illustrates very well why Ludgate Hill was sensibly closed some two decades previously. Ludgate Hill's island platform is of course that which replaced the original and temporary two platforms of 1865. The platform canopy remains largely intact and would continue to stand, albeit with increasing dilapidation, until the early 1960s. The steam-hauled train passing through Ludgate Hill is something of a puzzle; some of its vehicles, from what little can be seen, appear to be vans and this suggests a parcels or perishables train. Whilst parcels traffic was a familiar sight at Holborn Viaduct, the train seen here is routed onto the Snow Hill line so is presumably heading for either Smithfield or the Widened Lines with onwards movement from there. At Holborn Viaduct station a suburban electric multiple unit of pre-war design and no doubt a 4SUB can be seen peeping out from within the trainshed. Other units, probably of the same type, can be seen in Blackfriars station and vehicles appear to be of the shorter 57ft underframe variety suggesting early conversions from steam-hauled stock. Running across the picture left to right and passing beneath the steam locomotive is Ludgate Hill, with several London Transport STL class buses in attendance. Another STL has just crossed Ludgate Circus, left centre upper, and is disappearing west along Fleet Street towards Strand. By this time the once prolific and varied STL class was rapidly being replaced by the RT class and had but a few more years left in traffic. Most of the tram routes north of the Thames had been converted to mainly trolleybus before WWII but a few tram routes remained to serve the Kingsway Subway and Victoria Embankment. Among the latter were the 36 and 38 to Abbey Wood, operating via what was in effect a loop from Elephant using Westminster Bridge in one direction and Blackfriars Bridge in the other, hence the two route numbers. Blackfriars road bridge, used by the trams, is just visible at bottom left. Tram routes 36/8 continued to operate until the end London Transport's trams in July 1952. The Ludgate Hill area was not directly served by trolleybuses, the nearest point being the terminus at Holborn Circus, Charterhouse Street, just out of view beyond the top of the photograph. At Ludgate Circus (to the left of the steam locomotive) one of the obelisks can just be discerned; there was once two, one at the south end of Farringdon Street and another at the north end of New Bridge Street. It is just possible to discern the frontage of Ludgate Hill station, to the immediate left of the platform canopy, and which was hidden for many years by other buildings facing onto New Bridge Street, lower left. Looking to the right of the south end of Holborn Viaduct's platforms we can see an area of wartime bomb damage. At extreme right is Old Bailey and to its east was another large bomb damaged area which of course were among the many suffered by London and of which several could still be seen many years after the war ended. Records of the Corporation of London tell us the damage seen here was caused by conventional HE (High Explosive) bombs and incendiaries during The Blitz. This corner of the City of London was destined to largely escape the V1 flying bombs and V2 rockets which came later in the war although an area on the west side of Farringdon Street and just out of view at top left was seriously damaged by a V2, while another came down in the Thames to the east of Blackfriars Bridge, bottom right. Today the above scene has changed almost beyond recognition. Holborn Viaduct and Ludgate Hill stations have ceased to exist, while Blackfriars station has been much altered. Ludgate Hill, Fleet Street, Farringdon Street and New Bridge Street are of course still with us but in 2018 the only buildings instantly recognisable from this 1948 photograph are those with the concave corners at the bottom of Farringdon Street, overlooking Ludgate Circus.